I pulled up beside it and drew Arayo from her place in the back of the car so she could stretch her legs while I pumped gas. A big man was standing by the door, a kind of sentry, keeping guard over the one inside. I struggled to get the fuel pump to properly accept the pass code for my debit card, and a woman popped out of the station and began the exclamations and adoration I was so used to hearing from the Newfoundland people. "Oh, a Newfoundland Dog! Isn't he beautiful? He or she? Oh, she is so beautiful! You don't see many of these dogs around here!" As she made over Arayo, I noticed she was directing her comments more towards the secured vehicle next to me. "Look! Let her see! Isn't it a beautiful Newfoundland Dog? Look over here!" I peered into the back of the vehicle. The ambulance I thought was empty and just stopping for fuel was transporting a lovely young woman with long brown hair. From her stretcher against the far wall of the rolling mini hospital, she strained her head to turn around and look out the side door at Arayo and a smile stretched across her face, lighting the darkness of the foreboding facility. Unable to enter the ambulance, I held Arayo where she could see her until they were ready to continue their journey. The smile never left her face. After they departed, I finished pumping my gas and headed towards the highway again. Just as I was ready to pull into traffic, a siren screamed. We waited for the ambulance that rushed past us, headed back towards the city. I'll never know if this was the same or a different ambulance, but we hope it wasn't our new friend. That she is home and well tonight and that more smiles await her than those of a chance encounter with a visiting Newfoundland dog at a gas station. 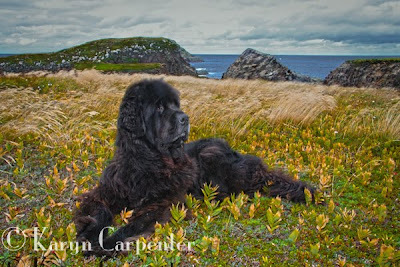 Photo: Arayo relaxes in the grass at my favorite spot in Newfoundland, near Elliston Newfoundland.